Summer is here in full swing and for many of us that means, it’s time for vacation. Some of us take trips and some of us are making plans that are more long term. That means renting a vacation home. Whether you’re looking for a summer getaway for weekends or if you plan to go away for several months, owning or renting a vacation home involves a lot of organization. It also involves a lot of storage issues, particularly if you are planning on renting a small beach bungalow. A.B. Richards can help make storage easier for you. We have portable storage containers that will help you get organized for a summer relocation. We also can get you that needed extra storage if you need it once you’re settled. So we want to give you some tips about storage for your beach home. There are things you ought to do before you even buy. According to Forbes, you should make certain to spend time in the home and make sure that the location of the beach home is a place you want to spend time. You also want to know your costs up front so make sure you understand things like fees, utility bills, property taxes and other costs. It’s important that you have a plan in place to keep the property secure and safe even when you’re not at the vacation home. Next, you should consider what to pack. This is where A.B. Richards can help. Our 20ft storage units are perfect for residential use. We can also deliver them to hard to reach locations. And that’s just for the trip to the beach. You’ll also need kitchen and bathroom supplies, books, CDs and DVDs cleaning equipment surf boards, fishing equipment, bicycles, toys and games, computer equipment and laundry items. You may need to bring a summer’s worth of clothing and furniture for both indoors and outdoors. At the very least, that can mean a lot of organizing. It can also mean that you won’t have enough room in your beach home for everything you’re bringing. If you have a very large haul that you’re bringing to your summer place, or if you have a large amount of items to organize, you should consider A.B. Richards’ 40ft storage containers or our 40ft Jumbo storage containers which have an extra foot of headroom. These units can help you store furniture and give you extra room to help you take care of difficult to store items. 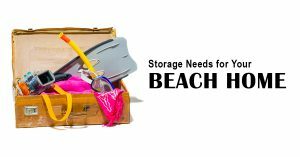 If your plans to spend the summer at a beach home have hit snags because of storage issues, A.B. Richards can simplify things. We’ll bring your portable storage container to wherever you need it, and we’ll pick it up at no extra cost. For more information, contact us today.